Talk Wellington looks at how Let’s Get Wellington Moving deals with 82,000 of the people in the CBD every day. Spoiler alert: they come from north of Ngauranga…. so sorry folks, you’re out of scope. 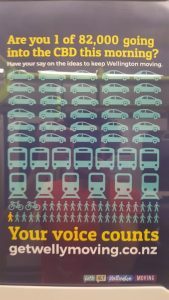 This smart looking poster is in lots of places this week – this (poor) photograph from a suburban train. It’s great: encouraging people from outside Wellington CBD to have a say in Let’s Get Wellington Moving, that well-intentioned initiative to Sort Out Transport in Wellington (see part one). It’s also kinda hilarious because it points to one of the great flaws in Let’s Get Wellington Moving: two little things called geography and people. Geography flaw: the LGWM scope is firmly cut off at Ngauranga Gorge. Its working title is “Ngauranga to the Airport”. Unfortunately, this means that out of scope is providing for the travel choices of the 82,000 people who descend on Wellington CBD from north of Ngauraunga everyday, i.e. 65% of workers in the whole region! That’s people with the CBD as their destination, and a relatively small minority passing through on their way to the airport, hospital etc. Yes LWGM want us to have our say, but without intending to do anything about our travel choices when we leave home. So the project is trying to sort out transport (movement through) in what’s fundamentally a destination (a city as a Place). This tension exists in all cities, and is one of the greatest challenges for cities’ leadership. But LGWM is setting itself up to fail by so badly mishandling it. People flaw: Northern Wellingtonians drive their commute. A lot. Spoiler alert…We’re mostly driving private cars for our commutes. Despite public transport use that’s historically been better than the rest of “Jump In The Car” NZ (thanks to investment pre-1990s), Wellington region’s public transport ridership growth has flatlined despite growing populations: we’re now consistently beaten by Auckland. Auckland! “Just Give Us Moar Motorways” Auckland! The reason: the way we’ve designed our suburbs, and what transport’s been supported with public money. Decades of urban and suburban development have built us places to live that push us to use our own cars to get to town (Wellington). Decades of transport infrastructure spending (including investment in car parking) have given us a transport environment that does the same. So yes, of course the majority of the Wellington region’s “north of Ngauranga” population (not to be confused with “Wellingtonians”) see it’s often cheaper, faster and more pleasant to drive your own car into Wellington. Storing the thing in the city during the day is the only really hard bit (for us). In case it’s not clear why this is a problem…. much as we love cars while we’re actually driving, cities are about what you do outside the car: shop, eat, work, browse, meet, talk, drink, listen, play, wander, spend. Storing lots of private cars is really terrible for the destination: cities as places for people, commerce, society and culture. This is the main reason why sensible cities are moving to minimise private car use in their centres (Auckland, Madrid, Oslo, Chengdu – the list goes on). So poor old LGWM. The “Lands Out Of Scope” generate an influx of expectant private car drivers needing day storage for their cars, and thereby kneecaps LGWM’s ability to meet its great principles. Pretty much all of them. 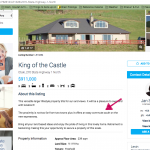 A screen grab from Harcourts advertising Ōtaki as “an easy commute south on the new expressway”. And what are we left with? An initiative that fails to consider the transport needs of 65% of its working population, and chops off the destination CBD from many of its “source” suburbs, right from the get go. “Surely someone’s got it sorted”? Yeah, nah. Talk Wellington enquired about this at the Scenarios Reveal event on 15th November. Officials acknowledged that Wellington’s regional transport really needs sorting (which many smart people know), but couldn’t point to anything that gave us even a glimmer of hope that this would happen. Not the Regional Land Transport Plan, not the Regional Land Transport Strategy… awkward silences abounded. As observers in Auckland are noting, Auckland’s version of this process had a proper geographic scope that included destinations and origins. Why did they think it was feasible in Wellington to sort out the destination while ignoring choices at the origins of the trips? More on this soon, including the implications for Newtown, but suffice to say … the “Lands Out Of Scope” are just another reason it’s starting to look like smart officials who should know better have offered Wellington a few expensive lemons for feedback. So what’s an Out Of Scope citizen to do? Before 15th December, have your say on Let’s Get Wellington Moving. This is important! Obviously you’ve got to make up your own mind, so read for yourself on their beautifully designed feedback website. We do have some suggestions that will give LGWM a good shove in the right direction: getting a better balance of destination and movement in our nation’s capital. Top tip: don’t listen to people telling you that because you live north of Ngauranga of course you want to drive all through Wellington city and “we have to decongest” so by 1950s logic “more tunnels and a flyover are a must”. Their logic is flawed, and has been debunked all over the world (yes, even Auckland). The best way to improve driving conditions and create a better city is to enable everyone who’d be happy not driving to get around in more efficient ways. So you prioritise that mass transit, make scooting, walking and cycling really great. Locals’ cars come off the road, freeing up the airport run for those who like to drive, and making the city nicer for everyone else! Building more space for cars first will only keep us in an expensive “get fatter, buy bigger pants” spiral. Your feedback can help give LGWM a good shove – improving the odds of a better balance of destination and movement in our nation’s capital. and in the box, writing your riff on this theme: “Scenario A (walking, cycling) is a good start but it’s not nearly enough. Wellington must prioritise efficient mass transit, and let it support denser landuse. Well, for now… but here’s the other thing you can do as a citizen. While the “Lands Out Of Scope” issue is a bigger beast, with a new government expressing their desire for more progressive transport, now’s a good time to tell them what you think. Contact the NZTA’s Lower North Island Regional Director Emma Speight, or the General Manager of Strategy, Policy and Planning Jenny Chetwynd. Elected representatives like the regional councillors on the Transport Committee are a good start too: Barbara Donaldson and Chris Laidlaw – and CC your own mayor (details on each council’s website). Email the Transport Minister and Associate Transport Minister. Tell them you want to see… some strong, progressive regional transport objectives set and met, so cities like Wellington can be good destinations for us and our kids. Transport must support that rather than undermining it. 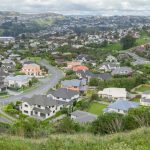 Whatever your reasons – a liveable and pleasant Wellington city, reducing climate emissions, healthier lifestyles, leaving our kids a half-decent urban legacy… it all works! Add a levy for private vehicles coming into town during rush hour traffic and reduce emissions and pay from light rail etc. Close Lambton Quay to vehicles and make pedestrian priority – they are the ones that use the space more than cars – Count them!!!! Light rail instead. We can be the best city in the World! And tunnel the basin now!! We don’t want a bridge – go to Thailand, Japan etc and see the consequences of doing that – not pleasant! Light rail is only part of the answer. The other part is to link it seamlessly to the existing suburban system (which incidentally, already has many light rail characteristics) and operate tram-trains on it as in the Karlsruhe model. Only then will it become relevant to the 82,000 who are “out of scope”. I can show you all manner of graphs showing increases in patronage when you change from bus to light rail and as many more when you change from light rail to tram-train. Sure, it needs good planning and co-ordination, and is a little more expensive than plain old light rail (although we can start with that, provided we use the same gauge and we can avoid the considerable cost of a brand new depot by sharing the existing Matangi facilities) but if the aim is to get those out-of-towners out of their cars, then this must surely be the long term vision. The railway station is a bottleneck, not an interchange – it would make a good pen for sheep but for people it is a form of torture. I dont see an issue with transfers as long as services are frequent and it does not incurr a fiscal penalty like the current situation. Also I cant see the logic in spending money on reducing capacity on the existing network, let alone dealing with interoperability issues. A standalone Light Rail system from the station south is my preferance. It would function in a similar manner to Londons circle line does extending the reach of mainline termini with a transfer. An interchange works well when there is one rail service changing with perhaps 2-3 bus routes, but works poorly when you have 4 rail services interchanging with about 20 buses. You only need to go to the railway station at 8 a.m. for half an hour to see how dysfunctional it is. Larger cities can afford to have several disconnected transport systems, but the layout of our region is best served by an unbroken rail spine. The circle line in London is a poor comparison because there are several interchanges, not a single point where all riders must exit. Having a giant interchange at a single point – the exact point where ridership is the highest, is a failed model that will attract very few of the 82,000 out of their cars. I am confused by your statement about reducing capacity. A light rail vehicle of equal length to an existing Matangi unit has the same capacity, if not more. Two such LRVs of 43 m each could easily be handled through the CBD at peak times. And in street running, frequency could be higher than the existing rail timetable. As for interoperability, the Germans mastered it 25 years ago, the French are into it, and now even the English are doing it (Sheffield-Rotherham) and are keen for more. If it really frightens you, we could start with the Johnsonville line – no interoperability required. Then have you forgotten about the cost of a brand new depot for an isolated light rail system? Why lock in two permanently isolated systems? Surely we can agree to the Johnsonville line at least? Having two isolated 10 km lines heading off in opposite directions, with separate depots, is surely the height of folly when we can have a single 20 km line. It’s a no-brainer. Here’s just one example. In Japan, they joined up two such isolated lines to form what is now the Echizen-Fukui line. Average weekday ridership went up 286% in one year. I could supply many more similar statistics from Karlsruhe where several individual routes saw ridership increases of 300% or more.